This is the third generation of Prom Dress flies. 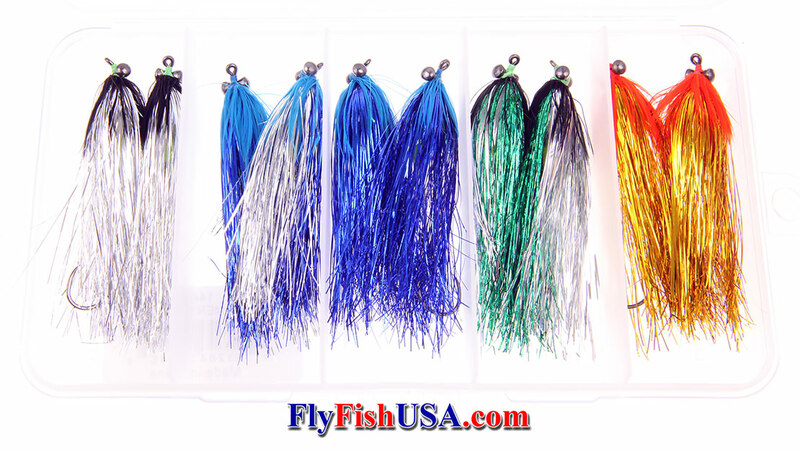 We could have called these "Prom Dress G3", but after development by several top rated fishing guides, several astute fly shops, and several top rated fly tying companies, and thousands of first and second generation of Prom Dress flies sold, we arrived at "perfect". The first generation Prom Dress flies were developed by Scott Howell. They were an instant success for skilled casters, or anglers fishing heavy lines. All of Scott's colors work, but some worked better than others. Blue was by far the most productive, so we kept it. For our waters we found that silver, blue & silver, green & silver & gold & orange are also killers. Then we reduced the overall size of the flies by about 15% and decreased the size of the lead eyes, so G3's are easier to cast. Also the eyes are now black (like the pupil in a bait fish eye). Ya' we know, steelhead don't eat a lot of bait fish, but Chinooks, silvers, smallmouth bass do, and steelhead eat these flies anyway.